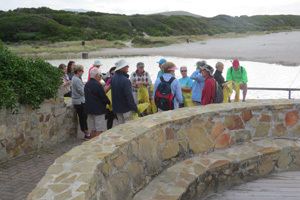 BirdLife Overberg’s last monthly CleanMarine coastal cleanup for the year was held at Onrus early this morning. 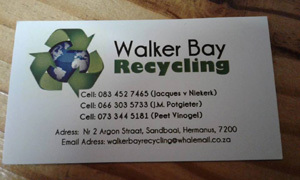 Our partners, Antonio da Sylva-Swart from the Coastal Cleanup Conservation Trust, Jacques van Niekerk of Walker Bay Recycling and Narina Howard of the Zwelihle Recycle Swop again joined with Jacques again sponsoring gloves, cleaning wipes, boerewors rolls and bottled water – many thanks Jacques. It was unfortunately decided that the children from the Recycle Swop Shop would not join us due to the possibility of protest action in the township. 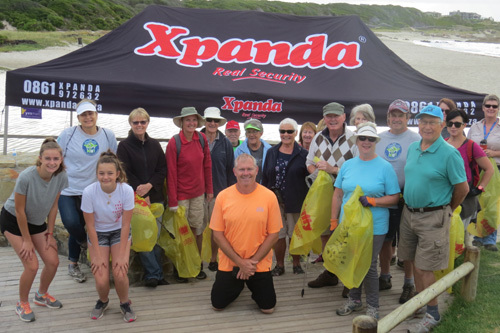 Twenty-seven volunteers joined us and we were delighted to also welcome members of Hermanus Bird Club to our conservation efforts. 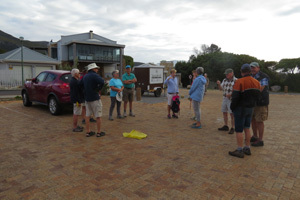 Two groups went out despite the possibility and threat of rain – I took a group along the Onrus beach and Elaine’s group worked the rocky shore between the beach and Harderbaai. 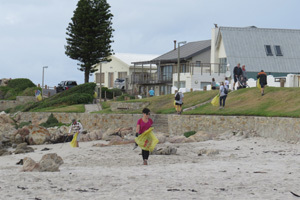 The area was fairly clean and this clearly is largely due to the efforts of the Onrus Litter Ladies that regularly clean this stretch of shoreline. This again shows that combined efforts can make a tangible difference. 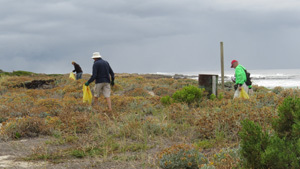 The hope is expressed that other groups of volunteers will take on similar action along their home patches along our beautiful Cape Whale Coast shoreline. 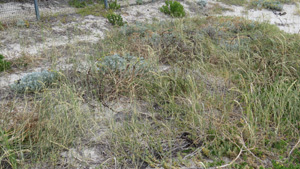 The beach was fairly clean and we decided to tackle the vegetation in the dunes behind the beach. Lots of cigarette butts, general disintegrating plastic pieces, bottle caps and rope were collected and three trouble spots were identified. 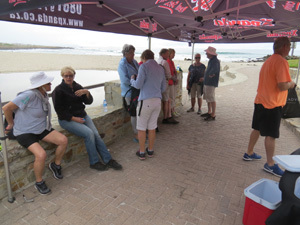 There is a spot close to the restaurant and estuary mouth where fires are made regularly – one assumes that young people braai there in the evenings. This area was littered badly and we had to spend a lot of time here clearing cigarette butts and other rubbish. (It is interesting to note that most of the butts by far were Marlboro – one wonders whether this is the preferred brand for young people these days). 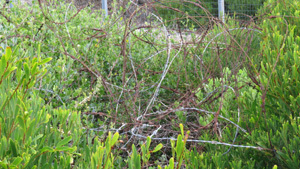 Sadly, the old razor wire that was left behind when the new fence was erected still litters the area. This was reported to authorities after our previous cleanup of the area and we will use others means to get this problem solved – watch this space. We also discovered some dense bushes near the Sandbaai side of the beach where vagrants clearly hide and there were signs that they sometimes sleep here. Several bottle necks also littered the area. This area was cleaned as well as we could, but there are still lots of beer and whiskey bottles, as well as cans deep underneath the bushes that we could not reach. Hopefully we will be able to get some youngsters to help us with this as the old “boeppens omies” could not reach the rubbish. It then started drizzling and we packed it in. Elaine’s group also returned with many bags of rubble even though Antonio and Elaine concentrated on collecting micro-plastics. We then enjoyed something to eat before returning home. We would like to express our sincere appreciation to all the volunteers who faced the elements with us. 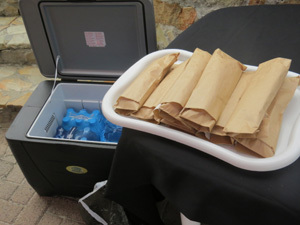 A huge thanks also goes to Jacques for providing his usual support and to John Kieser of Plastics SA for the bags. 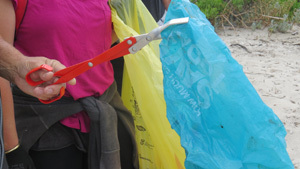 We are looking for a sponsor for many of these thongs for our monthly cleanups. Any ideas? Elaine and I enjoyed a glass of wine at the parking area and lookout point at Bitou Street in Vermont last Saturday afternoon and were shocked to see the vast amount of cigarette butts littering the area. We went there before returning home today and shockingly picked up more than 300 cigarette butts in an area that can accommodate a maximum of six vehicles at one time. We have been talking about addressing this major problem several times in the past and will share our ideas on this as we go along. Excitingly ladies hiking along the coastal path stopped for a chat and volunteered to join us for future cleanups. Thankfully it seems as if the penny is dropping and we are looking forward to many more successes in 2019. 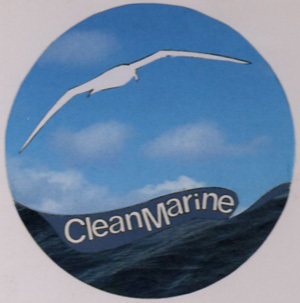 Kindly join our efforts – it is very rewarding to see how we are gradually beginning to make a difference. 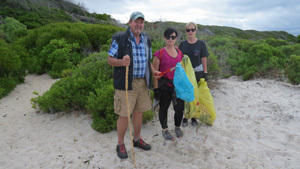 The next BirdLife Overberg CleanMarine cleanup will be on Saturday 26 January when we will again tackle the first section of the beautiful Hoek van de Berg Nature Reserve – watch the press and WhatsApp groups for details.